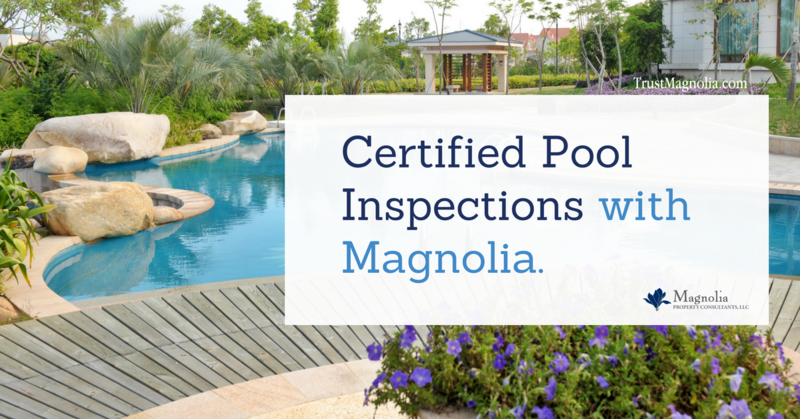 Announcing… Certified Pool Inspections by Magnolia! As a residential remodel contractor, I’ve had to rely on the expertise of trade contractors in order to ensure absolute success for our clients. Relying on a trade contractor’s expertise is especially important when the scope of the project is outside of my previous experience or when a crucial decision could be the difference in a major headache to the client that might be undiscovered until years down the road. Today I want to highlight the importance of relying on a 3rd party expert for pool inspections. The industry standard is a $75 up charge for a home inspector to perform nothing more than a visual inspection of the pool, equipment and presence of safety features. We at Magnolia believe it is unfair to up-charge and we perform this standard checklist pool inspection for free. We strongly encourage our clients to hire a 3rd party because any crucial problem with a pool or its equipment is going to cost much more than the cost of a 3rd party expert. If there is a problem, you want to know about it immediately! You want to identify that in an expert manner and place the burden of repair costs on the Seller of the property. An industry expert in any specific field is going to see red flag issue before and beyond a non-expert, with book knowledge about the general aspects of the functional performance characteristics of any component on a residential home. This is a core value of Magnolia Property Consultants and the reason we only hire individuals with previous careers in the construction industry as home inspectors. With a Magnolia Home Inspection we recommend only local trade experts, including a pool expert certified by the National Swimming and Pool Foundation. This expert is a graduate of the Certified Pool/Spa Operator Certification program providing a professional detailed status report of the pool, recommendations on repairs/replacement and service advice. Worst-case scenario the pool on the property you are purchasing is in need of significant repairs. Who will perform the repairs or oversee the repairs are completed in a professional manner? It is so important to have an expert in the industry to represent you, provide the scope of work and complete the repairs themselves or oversee that the work is completed to protect your long-term best interests. When scheduling your home inspection with Magnolia, don’t forget to ADD Pool Inspection to the order form if you have a pool on the property. We will handle all of the scheduling and forwarding the professional report to you and your agent.